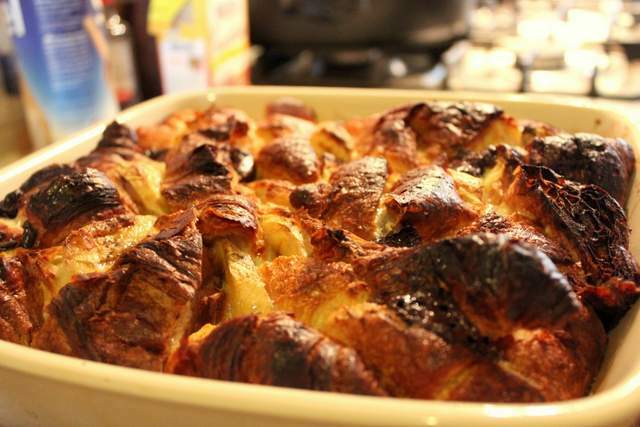 Home » Blog » Easy Peasy Chocolate & Banana Croissant Bread & Butter Pudding! Admittedly I am not much of a baker. I prefer make ahead puddings that need next to no attention before serving. If there is any pudding pressure, I risk epic failure. So when I do discover a dessert that I can make that tastes amazing and is effortless, then I am over joyed and I have to share it. Since my recent blog swop with Chez Foti with the theme of ‘Comfort Food’ (Pulled Blue Cheese Pork with Cider & Apple Sauce and Beef, Beer & Stilton Pie), I have been thinking about food that soothes the soul and gives you that totally contented feeling. Having posted a savory comfort food dish, I began to contemplate a sweet offering. For some reason when I chewed this over, my gut instinct was that it had to be something stodgy; reminiscent of school dinners even. The memory of hot, sweet puddings served to me in my childhood is comforting and cheerful, thus ticking all the necessary boxes. I saw a recipe for Bread & Butter Pudding ages ago that used croissants in place of the usual plain slices of buttered bread and I thought this was a wonderful idea. The idea of soaking these buttery flaky pillows of decadence in custard and baking them would most certainly achieve the desired level of stodginess that I was after for the full on comfort effect. And just to jooj things up even further, I decided to add some chunks of chocolate and slices of banana; little pockets of yumminess dotted within the pillows of baked pastry. (My mouth is watering just writing this!) For me, cooked banana and melted chocolate has to be one of the most sublime pairings known to man. How could this concoction not be knockout? The final piece of genius for this pudding is the fact that it took mere minutes to put together and it has to be done a good hour before you want to cook it, longer even if you like. Leaving you plenty of time to make and eat your first course and so avoiding all that last minute pudding pressure that I detest! Slice your each croissants into 3 pieces and then lay them in your oven dish (no need to butter them as you would do normally with bread as their butter content is already so high). Fit as many as you can into the dish. Then break your chocolate into squares and dot them in between the pieces of croissant. Repeat with all the slices of banana. In a jug, mix your milk and sugar and whisk in your eggs to make the basis of the cold custard. Pour it all over your croissants and leave to soak for at least one hour. Meanwhile, heat your oven to 160C/140F and when you are ready, bake for 40 minutes until the custard is set. The top will be lovely and crispy whilst underneath will be soft and unctuous with the set custard. Serve with ice cream or cream or even more hot custard if you like! Se easy and so good. I am entering this recipe into quite a few blog challenges: Firstly, this months One Ingredient Challenge which is the splendid ‘Banana’. Co hosted by Nazima from Franglais Kitchen and Laura from How To Cook Good Food. I am also entering for the very first time into Karen from Lavender & Lovage’s Tea Time Treats Challenge which is hosted by Kate from What Kate Baked this month and the theme is ‘Puddings’ so this recipe fits the bill. And I am also entering this into the Let’s Cook/Bake For Valentines Challenge as I made this pudding for my Husbands birthday which is infact, Valentines Day! And last but not least, I am also entering it into Credit Crunch Munch (a favourite challenge of mine) as I used stale croissants that I had left over in this recipe. Co-hosted by Camilla from Fab Food For All & Helen from Fuss Free Flavours. 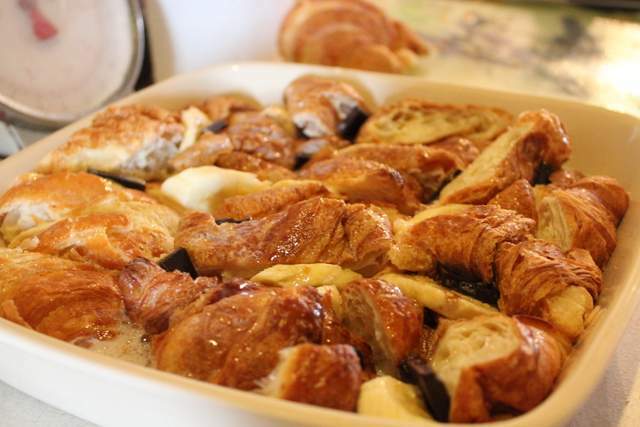 18 Comments on "Easy Peasy Chocolate & Banana Croissant Bread & Butter Pudding!" Thankyou for sending this recipe to Lets cook/bake for valentine event.It looks simply devine and very delicious. Hello and thank you! I am very pleased to enter for the first time but hopefully not the last ! What a perfect comfort pudding Anneli. There is nothing better than this combination. I have used brioche in the past but I just love the idea of using croissants. Banana and chocolate adds even more to it and I like to leave mine to soak also, as it makes the end result even lighter & fluffier! Thanks so much for entering One Ingredient. Just thought I should let you know that Nazima at Franglais Kitchen is the real brainchild behind One Ingredient. I am just the partner!!! Thanks Laura. Glad you like it. Thanks for the One Ingredient info…oops ! I shall amend the post. 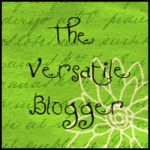 Hi Anneli – what a fabulous dish! I’ve never seen anything done with croissants before (except for the usual “split them open and stuff with ham and cheese kind of thing). I love this idea, how cool is this to make a pud with croissants instead of regular bread? Really gives it a beautiful appearance! Would make a great use for leftover pastries from these giant croissant buckets you can get from Auchan… they sell like 20 of the things in huge trays and I can’t ever imagine how all of them could ever possibly get eaten before going completely stale! Thanks Charles. It’s so simple to make, especially as you don’t even have to bother laboriously buttering slices of bread as the croissants are buttery enough. You are right, it’s a great way to use up stale ones you have left over from giant bags. Anything with croissant is a winner for me…! My kind of pud! 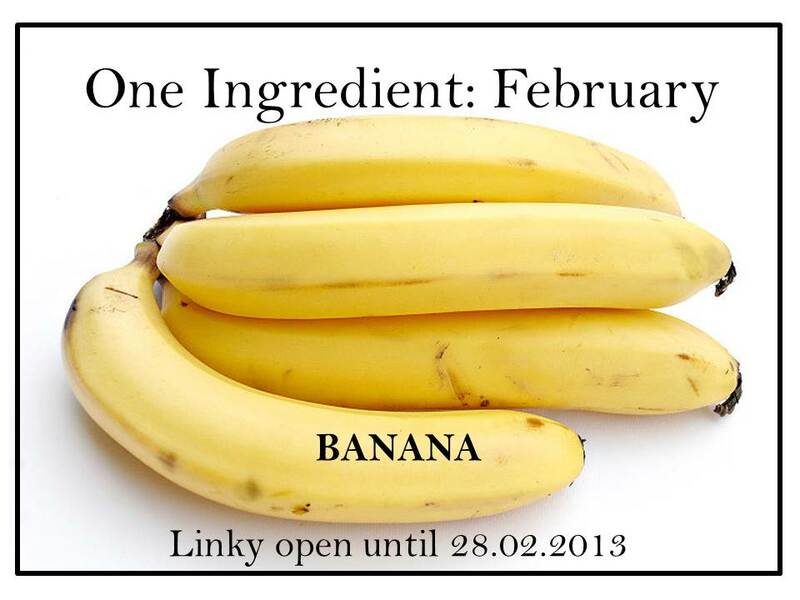 Funnily enough I’ve made this before using stale croissants and pain au chocolate adding extra choccie and bananas too – but I haven’t for ages now. Probably more to do with the fact we no longer seem to have such tasty leftovers lurking (they get gobbled by my gannet toddler!). Must make again, thanks for reminding me of it’s wonders! This certainly ticks the comforting and cheery box- thank you for entering it into TTT! What a gorgeous recipe. So beautiful (so much prettier than plain old bread!) and the banana and chocolate must make this pudding taste divine. Thanks Nazima. Glad you like it. I also think the rugged mountains of the croissants are rather beautiful. Just an added bonus that it also tastes really good ! Oh my! That looks wickedly good and I’m not even going to think about the calories! This is right up my alley too, easy puddings and cakes are the only way I can do something similar to baking. I must try this. I always eat a banana after my workout session. It gives me lots of energy. Thanks! Yes bananas are fantastic nutritionally! I try to feed them to my kids all the time!